End of tenancy cleaning is the single biggest cause of deposit deductions. At the same time, it is the easiest to mitigate, by performing an effective end of tenancy cleaning session before the final inspection. This guide will give you expert advice and tips to clean the property prior to claiming your deposit. Get 10% OFF End of Tenancy Cleaning by Fantastic Services ! Claim your discount and surprise your landlord with a squeeky clean property on the final inspection ! This discount is exclusive for members of The Tenants' Voice. 2 Who has to clean what ? End of tenancy cleaning is important for receiving your full deposit – More than half of deposit disputes (56%) are lead for insufficient, or have cleaning as part of a more complex dispute. Tenants can do their own end of tenancy cleaning. The landlord cannot force them to use any cleaning company, or a cleaning service at all. If doing your own end of tenancy cleaning, remember to use your check in inventory as a guide. Also, use a checklist and schedule your cleaning to ensure the property is fully cleaned. Set aside enough time, if you plan on cleaning yourself. Deep cleaning takes time and you’ll be surprise how big of a job this is. The inventory reports are the most important pieces of evidence for resolving a dispute. You want your end of tenancy cleaning done right before the move out inventory, as to record the property in the cleanest state. Your landlord cannot overcharge you excessively if you have not cleaned the property prior to moving out. If you want to hire a cleaning company for your end of tenancy, you should be weary of bad decisions. As your deposit is on the line, make sure the work is done and will suffice for reclaiming your money. When you move into a new property, it’s most likely very clean on your first visit. Tenants have a right to receive a clean and hygienic property, but they must also ensure the standard is maintained for the remainder of their tenancy. Most people don’t do deep cleaning on a weekly basis and that counts double in the months before their moving date. However, when moving out, tenants need to make sure the property is just as clean as it was when they first moved in. Since moving is an already tense, both tenants and landlords turn to the services industry to fill in that role. To fill in the demand, cleaning companies have introduced “end of tenancy cleaning” as a new service. In it’s core, end of tenancy cleaning is nothing more than you would do yourself with the bucket and mop. In detail, it’s a full top to bottom cleaning package designed especially for rented properties. Tenants are in charge of daily cleaning and maintenance in the property. They can be held liable if they allow lack of hygiene to cause a rise and spread of health hazards diseases, pest infestation and mould. The removal of these hazards is costly and the renters will be charged for the bill. The garden, driveway and patio are often assigned to the tenant, as part of the property as well. When doing the check in inspection, remember to confirm these areas are your responsibility. In the shared building areas, cleaning duties might are usually a responsibility of the landlord.. Some specialized cleaning services in the property are considered a responsibility of the landlord. A good example would be gutter cleaning, which is handled by your landlord. So, you already know that cleaning is the tenant’s responsibility. This responsibility dictates that when you return the keys to the landlord the property will be just as clean, as it was when you first moved in. Your landlord can request a hygiene standard equal to the one documented in the inventory agreement. As long as you return the property clean, you’re free to choose the means for sanitation. Demanding a “professional cleaning” when the property is already clean, or before the tenant has been given a chance to perform their own cleaning before the keys are returned is unfair. However, if you do not return the property in a comparable quality, the landlord is within their rights to hire a cleaning company and charge you for the costs. If the landlord agrees to have the property professionally cleaned before you move in, it’s fair to do the same before you move out. You should negotiate these conditions with your landlord before signing the tenancy agreement. Make sure you’ve agreed on a how to to prevent disputes at the end. The Deposit Protection Scheme confirms more than half of deposit disputes (56%) are the result of insufficient cleaning. This makes it the most common cause for deposit disputes. Surprisingly, inflicted damage comes second at 43% and redecoration third at 30%. If you have not performed an end of tenancy cleaning before you’ve moved out, your landlord will hire a company to do the cleaning, while discounting the bill from your deposit. This does not work your in your favour as the landlord will prioritise getting a good cleaning service, rather than keeping the price low. However, your landlord cannot deduct more than the total cost of the cleaning service. The receipt will be required as proof that the cleaning has been paid. Make sure you request to see the receipt for the cleaning service before you approve the deposit deduction. Because they have deposited a lot of money, it’s in the best interest of tenants to maintain the property at all times. The two inventory checks – when you move in and out – will benchmark the condition of the property. This is the most reliable evidence for how tenants have affected the property’s condition during their occupation. The only way to make sure the deposit is returned in full is if the two inventories are identical, or the second one is better. Some landlords hire end of tenancy cleaning companies before they let tenants move in. This sets a very high standard that will be expected when the tenants move out. This will be reflected in the move in inventory report, including high detail photos of the condition. Also, your landlord will probably provide you with a copy of the receipt that the cleaning company issued them. If you plan on cleaning yourself, make sure you put in that extra work and start in advance, so you have enough time to match the quality benchmark. It is to your advantage to do a thorough end of tenancy clean and meet all the responsibilities in your tenancy agreement. Otherwise, you will have a hard time winning back your tenancy deposit. Ensure that any damage caused by you or a visitor to your home is repaired or replaced. If you leave it up to the landlord to send you a bill, chances are the cost will be higher as they are unlikely to shop around for the best deal. Allow yourself enough time and energy to do the final clean and make it as near to move out inventory as possible. The cheapest option is to obviously do the cleaning yourself. While it’s nothing too scary, your moving experience can already be overwhelming, without any cleaning involved. On the other hand, if you have a lot of time before returning the keys, cleaning yourself is a good way to save some moving expenses. Before you start, contact the landlord or letting agent and request their final inspection checklist. To make sure you’re cleaned ENOUGH, you need to base your work on the checklist AND the move in inventory report. You need to match the quality you see in the report, while making sure each item you see on the checklist is cleaned. Kitchen – Empty all the cupboards and shelves. Remove all crumbs and deposits, clean inside and out and wipe thoroughly with a dry cloth. Do you best to pull out all appliances and wash the floors beneath them and the walls behind them. Make sure the appliances are clean, including the washing machine soap tray and the dishwasher filter. The back of most appliances is usually disty and full of cobwebs – make sure to wipe them with a dry cloth. After you have cleaned the fridge, if it is empty switch it off at the mains and leave the door open to prevent mould. Make sure to pull out all fridge shelves, cabinets and racks. Clean them good including the groves where they slide in the fridge. Repeat this for each appliance with similar features. Oven and hob – There is nothing worse than cleaning someone else’s oven when moving into a new property. If not cleaned often, the oven builds up thick layers of grime, burnt food deposits, grease and household dust. It all makes for a nasty cleaning job that requires the most time, effort and harsh cleaning agents out of all other cleaning jobs. Unpleasant though the task may be, make sure it is sparkling, as the oven is often the first item to be inspected. The same goes for the hob, burners, racks, baking trays, handles, switches and all other surfaces. You really need to put in the extra effort about your oven, or it’s not worth starting at all. Living room – You need to clean the coffee table and all cupboards, cabinets, bookshelves and TV set. Living rooms often feature extensive decorations and full bookshelves. This room is mostly about dusting extensively and vacuuming everything to perfection. There are many item and awkward surfaces to clean, so easy as it might seem, the living room is very time consuming. Bathroom – Scrub everything in the bathroom including the tiles, sink, bath, toilet, mirror and other accessories. Ensure the drains and plug holes are clear from debris and make sure the water runs away quickly. Remove mould, soap scum and limescale buildup from all metallic surfaces like the faucets, the shower, the drain grates. If the shower head has some of it’s holes plugged from limescale build up, you will have to clean it up. Detach the shower head and submerge it in white vinegar overnight. The day after, it should be cleared and working properly again. Walls – You should look for any scuffs or dirty marks on the walls. If it is not possible to wash them off, paint them over with some emulsion of the same colour. You may find unfinished paint pots in the shed or utility cupboard you can use. This is worth doing especially if there are a lot of marks, otherwise your landlord may decide to decorate and bill you for the cost! If you hanged any pictures or decorations on the walls there are probably a lot of nail holes. You don’t want your landlord to find too many of these, or they might throw a big fuss in the way of your pocket. Fill nail holes with wall filler putty and pain over. It’s important to clean all the mould if any and to also inform your landlord about the problem. Don’t paint over the mould – let the landlord do that, but try your best to remove it. Unfortunately, bleach is the most reliable cleaning agent against mould. Use a breathing mask and gloves when you use such harsh cleaning agents. Windows – Clean all the windows from the inside. If you can’t reach the outside yourself then arrange for a window cleaner to call. Alcohol and vinegar remain two of the best products you can use for cleaning glass and windows. If there are any cracked panes arrange for them to be replaced unless they appear on the check-in inventory. Windows make quick impressions on the general hygiene. If you make yours crystal clear, your landlord can be more likely to miss dirt in other spots. Furniture – You want to vacuum your furniture and wash it using a dry wash solution. The upholstery needs to look pristine – no smells, no hair, no bad odour. This is especially true if you live with small children, pets or smoke cigarettes. Alternatively, you can hire a steam cleaning service to wash all your upholstery items. For the wooden upholstery, you need to look for scuff marks, scratches and dings. Use almonds and coffee grounds to rub on the scuff marks and scratches. For minor issues, they will do well to mask of the damage. For a dazzling finish, you can buy a wood polish or use lemon oil. Rub well into the wooden parts and your furniture will look brand new. Curtains/blinds – If the curtains are washable then follow washing instructions or take them to the dry cleaner and dust the curtain rods. Do the same with any fabric blinds in the property. Thoroughly dust both sides of the slats of venetian blinds. Repair any damage or replace if the blind has become unusable. Carpets/Rugs – If you have a steam cleaner, this is a great way of bringing up carpets and rugs to look like new. If not, they are relatively cheap to hire, and include various attachments to enable you to clean every part of the property including floors, tiles, windows, walls, and furnishings. The minimum thing you should do is to vacuum all carpets and scrub them with a wire brush to remove all the hair trapped in the fibers. Staircases and hallways – These are areas with a lot of traffic and would be in need of more serious cleaning. The carpets and rugs might require steam cleaning to get all the dirt and grime out. Garden and exterior – If there is a garden shed make sure it is clean and tidy. Hose down any decking and sweep up leaves and other debris from patio areas. Make sure that flowerbeds are in good order and mow the lawns where applicable. If the gate is broken and wasn’t when you moved in, repair it. If it was broken when you moved in there should be a record of it on the inventory, otherwise you will be held responsible. Are you looking for a downloadable checklist ? You can download a free PDF copy from Broschdirect, as well read some invaluable tips on how to get done with end of tenancy cleaning faster and more efficiently. Cleaning the whole property by yourself is a hard and arduous task. You should consider whether you have the time and energy required to complete the task up to par, so you can receive your deposit in full. This is the primary reason why you’re going through all of this in the first place. If you are cleaning by yourself, allow enough time to hire equipment, buy the right products, have things dry cleaned, and replace/repair items. Be thorough, tick things off your list as you go, take photographs when complete, and ask a witness to sign these before the final inventory check and handing over the keys. The above list is extensive, but in no way does it list everything you need to clean before you can move out with your deposit. If you don’t have the time or energy required to go through extensive cleaning, maybe hiring a company is the solution for your move. Before you make your booking, however, there are a few things you need to know. There are many companies that offer the service, but not completely understand what it constitutes. End of tenancy cleaning is designed for people moving out. To get their deposit back, tenants are in need of reliable services and result. That’s why is important that the company you pick offers you thorough cleaning lists that covers more items in the property than you can think of. If they truly offer end of tenancy cleaning, they need to be ready to work with any provided checklist by your landlord or letting agents. Check if they clean the oven, as it’s the most difficult cleaning job in the whole property and will be required to pass the final inspection. More important, the cleaning company needs to guarantee you a pass on the move out inventory. If the service is not sufficient, financial compensation or a re-clean is due. The cleaning company you hire needs to allow for at least 24 hour guarantee for hygiene. You need this time to hold down the final inspection, before the property starts to naturally accumulate dust and dirt. A very important aspect is quality of work. Since you have a lot of money on the line, you have to pick a company with preceding reputation for quality cleaning. Make sure the service is not based on time, but size and contents of the property. The end of tenancy cleaning must endure through the final inspection. To do that the workers have to clean everything and anything until it’s perfectly clean. Having the cleaners in for an X amount of time will not make sure all the contents of the property has been thoroughly cleaned. A cleaning company that understands this will know how important the quality of their work is for moving tenants. Your move out cleaning team must bring all the required tools, cleaning solutions and machines they will need to complete the job. These should be included in your final quote. If anyone asks you to pay extra for any common cleaning solution or consumable, they might try to scam you. Contact the customer service department of your cleaning company and get to the bottom of this problem. Naturally, you shouldn’t pay anything outside of your original quote and the pre-arranged extra costs. Look for an insured provider. You will be letting people in your home for hours without your attendance. To protect your belongings and your landlord’s property, only choose company with vetted employees and insured services. Any damage or theft caused by the workers will be compensated by the company. Provided you’re in good relationship with your landlord, even though you’re moving out, you can always ask them for help with your end of tenancy cleaning. That said, you would not expect your landlord to knock on your door, buckets in hand, but they can assist you with your choice of a cleaning company. Most landlords that have been in the game for a few years, have hired services by a plethora of companies. Seasoned landlords can direct you to the best companies in the industry, who provide great customer experience and well formulated prices. Rather than going through extensive research, review reading and price-checking, you can use the supplier your landlord does and save yourself the hassle. An added benefit is your landlord’s supplier will always fulfill their expectations and ensure your deposit back. To make sure you don’t get unfair treatment, you must be sure to leave the property with a comparable condition to the initial inventory check. Make sure to have cleaned property good and all necessary repairs have been completed before the move out inventory check. Make arrangements to attend the inventory with your landlord. If you have second thoughts about your landlord, be weary of their actions during the final inventory and the deposit return. 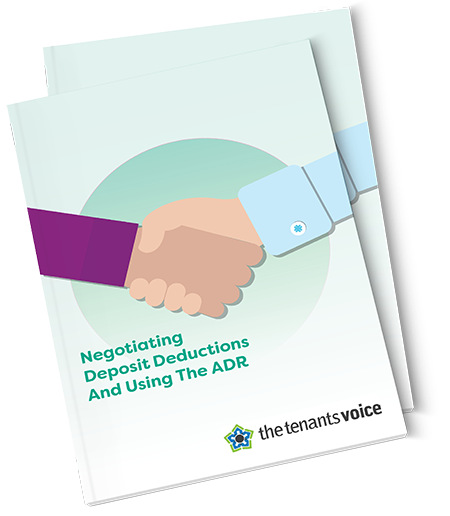 Rogue landlords use this time to try and snag as much of your deposit as possible, using absurd accusations, overcharges and hidden fees. Here are some horror stories which often occur with unfortunate tenants. A common practice for rogue landlords and letting agents is to have close relationship with a certain cleaning or handyman company that overcharges huge amounts of money for simple jobs. The landlord or letting agent can get a commission for attracting new clients. They will try to persuade you that you need to pay X amount to company ABC (not reflecting any real world company) or you will not get back your deposit. Another troublesome situation is where the landlord wants to deduct from your deposit, but not hire a cleaning company. They might attempt to hire themselves as the cleaner and charge you for absurd work hours at an even more absurd rate, while only doing an average clean or none at all. If you fall into such a trap, you need to reject everything and contact your tenancy deposit scheme immediately. Reference the Office of Fair Trade and provide all the prepared documents about your tenancy to prove your case. The scheme can provide you with legal information and assistance about recovering your deposit. Furthermore, the deposit protection scheme can provide you with it’s own Alternative Dispute Resolution service, which is entirely free of charge. The deposit protection scheme will not release your deposit without your consent or a court order, so you need to stay collected and know at all times that your deposit will not be stolen by unlawful practices. If you find out your deposit is not protected in a government authorised scheme, file a claim to your local county court. Your landlord must always protect their tenant’s deposit and failure to do so is a breach of the tenancy agreement which is punishable up to 3 times the original sum. We advise all tenants to act respectfully with their landlords and letting agents and seek a peaceful resolution to problems with their rented property. For more information, explore the articles in our Deposits category. Claim your discount now, use code FTTV10 at checkout !